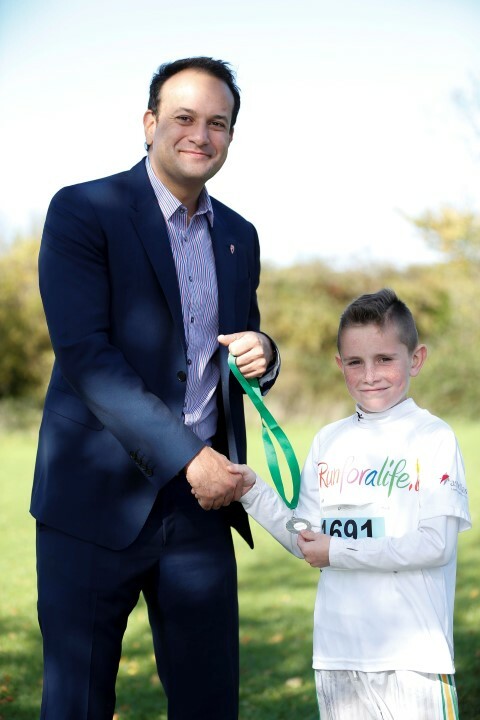 *** NO REPRODUCTION FEE *** DUBLIN : 18/10/2014 : Pictured (l-r) was Health Minister Leo Varakar congratulating Thomas Dolan (age 9) from Tullamore Co Offlay in the e Irish Kidney Associations Run for a Life family fun run sponsored by Astellas Pharma Co. Ltd family at Corkagh Park, Dublin this weekend. Health Minister Leo Varakar congratulated hundreds of members of the general public, young and old, for the charity fundraiser to demonstrate solidarity in support of the work of the Irish Kidney Association and the promotion of the importance of organ donation. The fun event offered participants of varying levels of fitness the option of walking, jogging or running competitively in either a chip timed 2.5km, 5km or 10km distance. Speaking in advance of the event, Minister Leo Varadkar said, Im looking forward to the Run for a Life. People of all ages are taking part in support of people living with organ failure. I want to encourage more people to sign the organ donor card and help to save lives in the future. Race Organiser, Colin White explained, Our annual Run for a Life, which is now in its sixth year, is a great day out for all of the family. We invited the public to join us in this celebration of life through sport. We are looking for the public to think about it, talk about it and make a commitment to organ donation. The Minister for Health Leo Varadkars participation in the event, despite his demanding role, sends out a clear message of support for organ donation and transplantation. By running in the event, Minister Varadkar is literally leading by example. A large number of the members of the successful Irish team who participated in the 8th European Transplant & Dialysis Games in Poland in August this year, took part in the Fun Run showcasing the success of organ donation. Also supporting the event was Prof. Jim Egan, Director, Organ Donation and Transplant Ireland, HSE. Picture Conor McCabe Photography.